You could call Niki Singlaub a “product guy.” More than an inventor, he lives for designing, developing, and launching new products into the world. Niki’s expertise stems from almost twenty years in design, development, and product management. Additionally, a background in engineering and business has prepared him to problem solve at all stages. On most days, you can find Niki in and around the high desert of Bend, Oregon testing gear, brainstorming ideas, and taking his family beyond their comfort level. I should have ordered two! This water bottle is high quality. 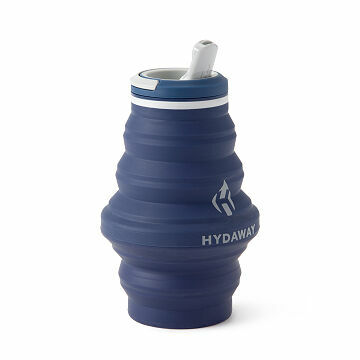 It's the perfect size to hold a serving of water and easily compacts to fit in your pocket. I was skeptical it would work, but it's perfect! We will tell you when they get back from the trip. Water bottle was cool enough for the kids to take to Lollapalooza and is now coming on our family vacation. My step-mom is outdoors A LOT, and this is perfect for her! Instead of carrying around a large, empty bottle, she can slip this into her coat pocket for later. I need more of this product for my whole family! This water bottle is exactly as it is described. It's light weight and collapses to fit in your pocket. It's nice to take on walks and you don't have to hold it after it's empty or search for a trash bin. We just collapse it and put it in our pocket! My teens love it! I bought this for my preteen ballerina. She "likes what she likes," as they say, so I took a gamble to buy it. She loves it! She never uses her other water bottles anymore and it makes room in her bag of chaos on the way to & from class.